1 of 5 Heat oven to 350 degrees . Coat two 9-inch round cake pans with nonstick cooking spray. Line bottoms of pans with parchment paper. Coat paper with spray. 2 of 5 In a medium bowl, whisk first 5 ingredients. Set aside. In a large bowl, beat melted butter, eggs, sugar and 1 1/2 tsp vanilla. On low speed, beat in flour mixture. Fold in carrots, pineapple, walnuts (if using) and raisins. Divide batter between prepared pans. Bake 35 minutes. 3 of 5 Cool layers in pans on racks for 10 minutes, then invert onto racks, remove pans and parchment, and cool completely. 4 of 5 While cakes cool, make frosting: Beat cream cheese, softened butter, confectioners' sugar and 1 tsp vanilla on medium speed until smooth. Add heavy cream and beat until spreadable. Spoon 1/4 cup frosting into a small bowl and tint orange. Spoon 2 tbsp frosting into another bowl and tint green. Transfer to separate small resealable bags. Snip a small corner from each bag. 5 of 5 Place 1 cake layer on a pedestal. Spread top with 3/4 cup frosting. Add second layer and frost top and sides with remaining frosting. 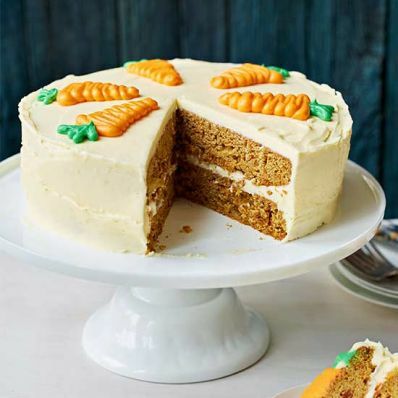 Pipe carrots on top of cake. Per Serving: 2 g fiber, 60 g sugar, 7 g pro., 360 mg sodium, 648 kcal cal., 33 g Fat, total, 20 g sat. fat, 82 g carb.